A complete walkthrough of Keyblade Graveyard in Kingdom Hearts 3, including ally characters, obtainable equipment, items, and bosses. Starlight Obtained after defeating the Demon Wave with the Keyblades of the fallen warriors. 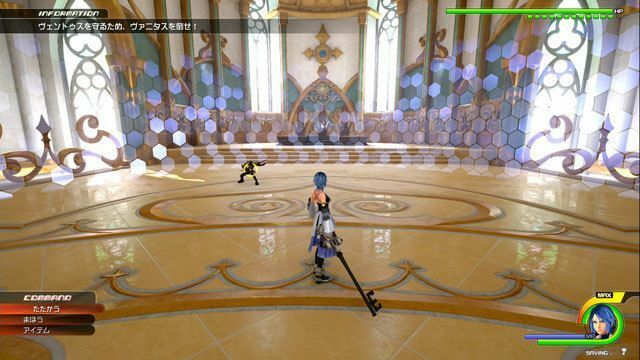 Physical attacks are very effective against Anti-Aqua, so equip a Keyblade with the highest Strength stats. You can also use Thunder magic against her to deal decent damage. The boss likes to teleport and spam Ice magic attacks that you should avoid or guard against. When Anti-Aqua performs the spinning dance attack with her clones, move outside their circle. Attack when she returns to the center. Don’t forget to use Attraction Flows and finishing attacks to stack up on damage when you catch her in a combo. Proceed to the second floor. Watch the event in Yen Sid’s chamber. Aqua has access to powerful magic when you go up against Vanitas. Using Thundaga allows you to damage Vanitas while keeping a safe distance away from him. However, be mindful of saving MP as well for when you need to heal yourself with Curaga. Vanitas uses various forms of Fire projectiles so focus on dodging them when he casts them. When you do hit Vanitas with melee, settle for doing one combo on him before going back to dodging his attacks again. You can usually catch Vanitas off-guard after he performs his series of jumping AoE attacks. Click here to check out our Vanitas Boss Guide. Attack the cube to rotate the world and gather the various fragments of Sora running about the area. Collect the required 111 to proceed to the next area. After gathering the 111 fragments, you will arrive in Olympus again. The Lich uses illusions of itself that explode when you attack them. Keeping track of the real Lich is not hard, so pay attention to the direction it moves after it summons the illusion. Focus on Luxord first since he has the lowest HP among the three. Larxene can be dealt with by guarding against her attacks then counterattacking before she recovers. Lastly, long range Magic attacks work well on Marluxia since he doesn’t have the best range nor abilities to quickly close the gap and deal damage up close. Ansem will be present during the first phase of the fight. Focus on attacking him while keeping Xigbar in your view to avoid his projectiles. The Riku Replica will be busy fighting Riku at this point. Ansem will eventually leave the battle. During the second phase of the fight, engage Xigbar. The best time to attack him is when he is reloading. After taking him out, engage Riku Replica. His attacks won’t be a threat if you go airborne when he unleashes them. Vanitas is the easier target of the two and can be caught off-guard very easily. Just watch out for Terra-Xehanort’s attacks, especially the quick dash attacks, when you’re busy with Vanitas. You can hit either of them with Thundaga for nice amounts of damage. When Vanitas’ HP has dropped significantly, he will start riding on a wave of Keyblades. You can try to use Guard to block his attacks. After defeating Vanitas, you will now have to take on Terra-Xehanort by himself. Attacking him from a distance is generally a good strategy. The boss will eventually use a Summon that fills the outer area of the battlefield with rays of magic, limiting your party’s movement. The Summon will also continuously attack inside the safe zone, so focus on dodging his attacks during this phase. Also, it is a good idea to be fully healed here as the Summon will cast a powerful AoE attack before it disappears. Continue to focus your attacks on Terra-Xehanort to defeat him. At the first phase of the fight, you will go up against Saix and a hooded Xion. Ignore Xion and focus on Saix. He will eventually charge his Berserk state which makes him invulnerable to damage so don’t attack him when he does this. When the second phase begins, wait for Roxas to give you an opportunity to unload on Saix. Watch for when Saix’s Berserk gauge runs out to push on the offense and defeat him. Prioritize taking out Young Xehanort first. When he starts to summon blue “bullets,” attack him to interrupt it. Next, focus on Xehanort. Deal with Ansem last. 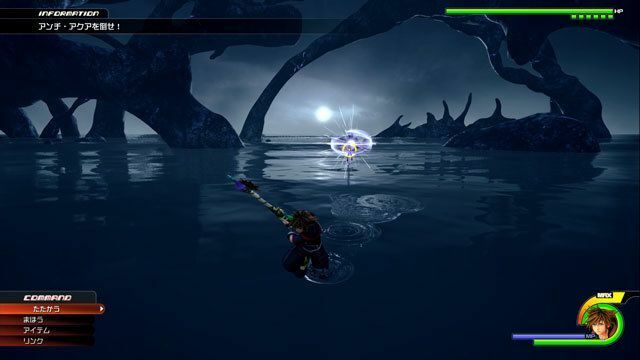 When Ansem summons a large sphere of energy, you can approach him with a dodge. This gives you an opportunity to damage him after he performs the attack as he will be off-guard. Ansem can activate a shield while moving that makes it hard to deal damage to him. You can kite him and strike at the moment his barrier dissipates.